What’s a Sleep Pod we hear you ask!? Well if you know, you know, but if like us you had no idea what these mobile beds are, then in summary, they are a sanctuary for rest in an otherwise busy environment. They are used in offices, airports, festivals, events etc around the globe. So what have sleep pods got to do with us at Silvertoad? 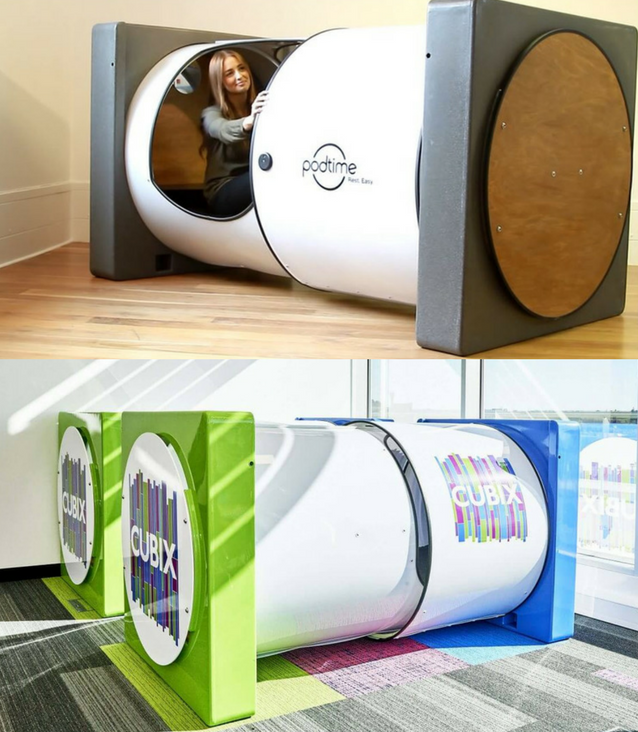 Our friends over at Cubix Office Services wanted to jazz up their sleep pods and have them branded for the launch of the new office spaces at the top of the Hampton by Hilton hotel building and we were more than happy to help! Despite it being one of the most challenging jobs we’ve done, we really enjoyed working on this project and were proud to be called upon to help make it happen, in a very short space of time and with a number of initial difficulties to overcome. Least of all being their location several floors up and needing to be taken apart and re-assembled! We used a mixture of techniques and materials to achieve the stunning end results, which included laminated vinyl and vehicle-grade colour spraying and finishing. We were crazy and confident enough in equal measure to take on the challenge and delivered on time, in advance and a very happy customer as our reward! We’d love to know if this has been done before and to this level? We can’t find any evidence of it online and have to assume not! We know why now, it was one of the most difficult jobs to undertake and to do, but the end result was stunning! We wonder if these the world’s first branded sleep PODS? You can view the fabulous Cubix offices website here As well as being beautifully fitted out with brilliant facilities, the 360 views of Luton (as you can see from some of the pictures) are stunning and make this location a really lovely place to work. Newcomer Cubix has already been voted as one of the top 10 unique offices in the UK and offer modern air-conditioned two, four and six person serviced offices and hot-desking spaces in Luton, Bedfordshire.